Alan Ansen, Contact Highs: Selected Poems, 1957-1987, Dalkey Archive Press, 1989. "Alan Ansen's first book," James Merrill has noted, "Disorderly Houses (1961), dedicated to both W. H. Auden and William Burroughs, was also his last to be published commercially. Since then this prolific and unpredictable poet's work has been available only in editions of his own devising, distributed to friends at his own caprice. As one of the happy few, I can report that his gifts remain as brightly unnerving as ever." Though perhaps best known as the model for some of the most flamboyant characters in Beat fiction (Rollo Greb in Kerouac's On the Road, A. J. in Burroughs's Naked Lunch, Dad Deform in Corso's American Express) and as Auden's secretary (he helped Auden with the syllabification of The Age of Anxiety), Alan Ansen is an accomplished poet in his own right. Having affinities with both the Beats and the New York school of poets, Ansen fuses Beat sensibility with formalist rigor. Contact Highs is the first comprehensive collection of his poetry, and includes a biographical introduction, an afterword by poet Rachel Hadas, and a bibliography of Ansen's elusive works. Alan Ansen, The Table Talk of W.H. Auden, Ontario Review Press, 1990. In New York, between 1946 and 1948, the scholar and poet Alan Ansen made rapid notes of Auden's inimitable conversation. 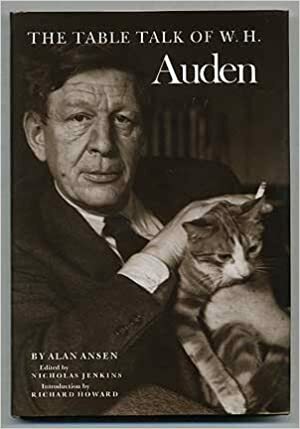 This book is a record of Auden's private, offhand and sometimes wayward remarks and opinions about art, literature, music, politics, religion and sexuality.